This post is kind of a product shout-out that I am excited about. You will all probably remember that I recently completed my 10th open water swim race. Until today I had those medals on 2 nails on my wall. The idea was that looking at the medals each day would help motivate me to keep swimming and trying to stay in shape. Well, a few weeks ago my friend over at http://www.disneyinyourday.com/announced a giveaway on her blog for a medal hanger from https://www.medalhangers.com/. I had never heard of a medal hanger and I thought they were really beautiful. I entered the giveaway and to my delight I won!!! I never win everything so it was so exciting! I used my prize and added a little bit to make a custom hanger and I love it so much! I came up with the saying ‘Water Knows No Size” because I think it encompasses my swim philosophy. There is no other place where I could win 10 metals but in the water and in that sense the water knows no size. In the water it is about how fast I move my arms and legs not how much I weigh. I’ve always felt at peace in the water and most girls are self conscious in a swimsuit but oddly enough it is where I feel the most confident. Go figure! Anyway, I know a lot of you race and I thought I’d share this quality product. They have 100% satisfaction guarantee and they are built to last. Your medals are something to proud of and this is a way to show them off and hopefully be encouraged by them. I think it would be a great thing for kids to see and hopefully encourage them to enter their own races or other athletic enterprises. 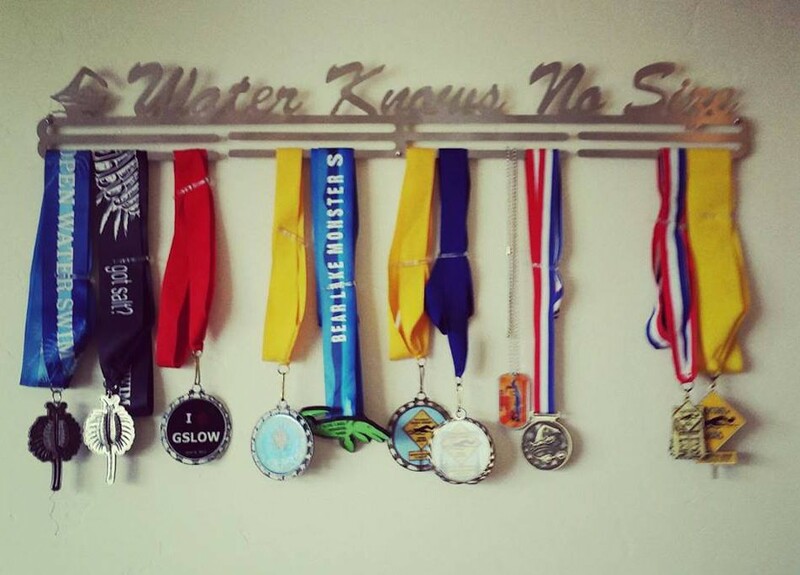 If you get a medal hanger I would love to see what you chose. (I’m not receiving anything from them. Just thought it was a good product and I’m really enjoying mine.